Back in November I wrote about the Minnesota company Epicurean, who makes cutting boards and utensils out of recycled materials or materials taken from sustainable providers. I really like how durable and easy the cutting boards were, and while I was picking up some as gifts I decided to give their utensils a try. Epicurean makes four lines of wooden utensils. Two of their lines are completely made out of low-impact materials. Two other lines have either plastic or silicone components, and while they look nice enough they don’t seem to fit the eco-friendly motif of their usual products. Of the two more eco-friendly lines, the Kitchen Series is geared towards regular folks like myself. Epicurean also makes a more durable and expensive line for professionals called the Chef Series. Today I’ll write about the Kitchen Series utensils I own. I purchased a large spoon and a large saute tool from Eversharp Knives in downtown Minneapolis. They’re a great store, and sell Epicurean first quality and factory seconds. I was about to buy both tools for about half off. Even at full retail, the Kitchen Series utensils are about $10 each. I bought mine for about $6.99 per. The utensils feel well-crafted and sturdy without being unwieldy. 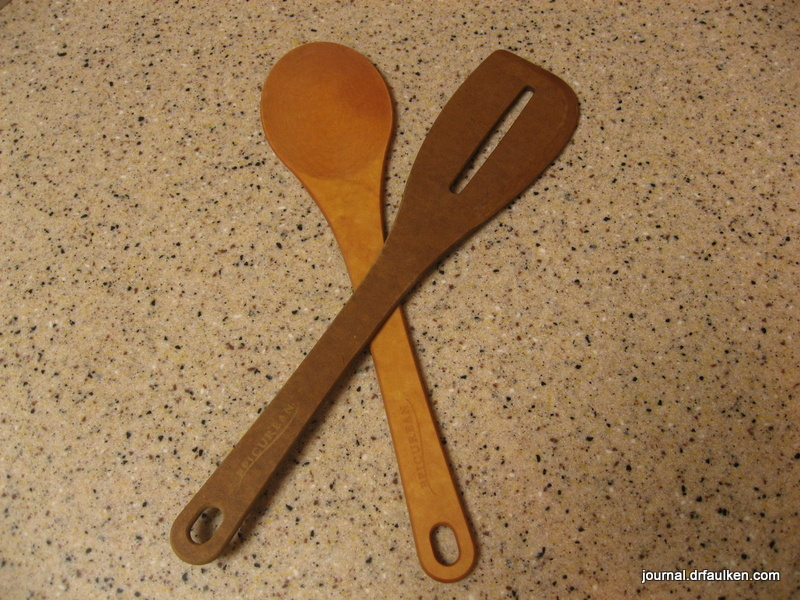 Like the cutting boards, the wooden spoon and saute tool are made out of wood from sustainable and/or recycled sources. You can read more about the company’s history and manufacturing processes, but one of our tools is made out of 50% recycled cardboard, and the other from low-impact trees. Both utensils are dishwasher safe, and tolerate up to 350°F. The materials used in both spoons are nonpourous and resists bacteria. The spoon, which is made out of new materials, is certified by the National Sanitary Foundation and the Forest Stewardship Council. The utensils are safe to use on non-stick cookware. I really like using the saute tool. I don’t personally use the spoon very often for the things I cook, but Sedagive? likes it as well. The saute tool has a beveled edge that makes it easy to push around eggs or pieces of sausage or whatever I have frying up in my cast iron skillet. I like the heft of the utensils, especially compared to flimsy plastic tools I’ve used in the past. I also don’t have to worry about any plastic bits melting if I leave the saute tool on my skillet. I recommend the Kitchen Series tools made by Epicurean. If you live in the Minneapolis area you should swing by Eversharp to see if they have any discounted factory seconds for sale. Mine look great, and were almost half the retail price. You can order directly from Epicurean, but I’m not sure what their shipping prices are. Amazon has the spoon for the suggested retail price. As of this writing, the saute tool appears to be about $5 more than retail. If you plan on buying things from Amazon and you have a Prime account, it might turn out to be about the same as getting it directly. You can also find Epicurean products at places like Bed Bath & Beyond, Crate & Barrel, and some grocery stores, but I’m not sure if they carry the utensils or just the cutting boards. Use this store locator to find retailers near you.